Vermin control workers investigate the presence of pests and vermin that are hazardous to public health or cause nuisance, lay traps and baits to eradicate pests, and treat areas of infestation. Inspect premises and study reports (e.g. from the public or property owners) to identify infestation source, pest entrances, extent of damage to property, access to infested locations, etc. Determine treatment required to eradicate pests and vermin. Measure area requiring treatment, calculate fumigant requirements, and estimate cost for service. Post warning signs and lock building doors to secure the area to be fumigated. 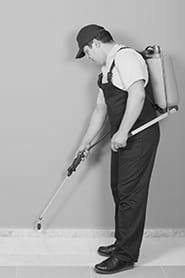 Lay traps and baits, and fumigate and disinfect areas by spraying or dusting chemical solutions, powders or gases, to remove infestations. Return to sites to examine traps and the continued presence of pests. Dispose of dead and captured animals, and handle and store pesticides, following the correct procedures. Clean the work site after the completion of job, and proof the area to stop pests returning. Advise property owners on courses of action to prevent the return of pests. Liaise with environmental health officers, housing officers and other relevant authorities where measures on a large scale are required to remove pests. Record work activities performed and complete reports.